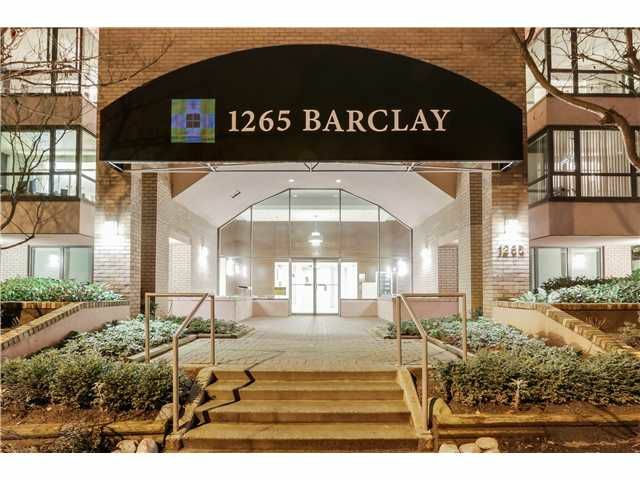 Beautiful, bright 2 BR suite w office, wonderful lge MBR w Kingsize Bed, hdwd floors, paint,light fixtures, new s/s kitchen appliances & new W/D. 2 pkg & 1 private strg lkr. NW Terrace with views of Mountains. Office/Solarium has peak a boo view of English Bay. 1265 Barclay is a Concrete Mid Rise, 11storey/36 unit bldg that was bought in 2007 by the Wall Group. Plumbing, piping & building envelope were replaced in 2009 along with all common areas, gym, sauna and business mtg room were updated. The suites were sold in 2012. Live in or rent! Walk to shopping, cafes, restaurants, entertainment, English Bay & Stanley Park & Robson St! A MUST See! Make this your New Home!